Identity theft is on the rise, and many people fall victim when cyberthieves target their banks. In 2012, 12.6 million Americans were victims of identity theft. CNN.com reported on Houston veterinarian Mike Janney, who was completely unaware of any fraudulent activity until Bank One contacted him about an $85,000 outstanding credit line. Janney later found out that a bank employee had sold his personal information, along with the information on dozens of other customers, leading to more than $12 million in fraudulent bank activity. Twelve million bucks is a lot of money, but it’s just a piece of the pie when it comes to identity theft. Last year, banks lost more than $10 billion thanks to fraudulent loans and credit cards, according to the latest survey by Javelin Strategy and Research. Would-be identity thieves are discovering new ways to obtain private information. 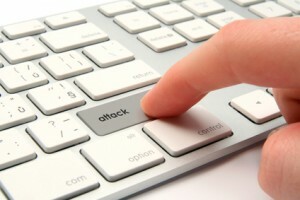 Last year, the FBI, the Financial Services Information Sharing and Analysis Center and the Internet Crime Complaint Center issued a joint fraud alert that warned banks of an upswing in wire transfer fraud they expected to continue: Cyberthieves were targeting financial institution employees with phishing emails and spam, attempting to install keystroke loggers and remote access trojans. Using these programs, the cyberthieves had gained access to user accounts and authorized a series of fraudulent wire transfers in amounts ranging from $400,000 to $900,000. For many victims, the money lost through checking accounts, wire transfer fraud and illegal lines of credit is never returned. Mari Frank, a lawyer and identity theft victim specialist, told NBC News that one debit card fraud victim lost more $30,000. While credit cards come with generous protections against fraud—most limit liability to $50—debit cards, banks and other financial institutions do not offer such protections. According to the FDIC’s Regulation E, consumers have two days to report an electronic funds transfer problem, such as the unauthorized movement of funds from a checking account into a PayPal account. If the unauthorized transfer is reported within two days, a consumer’s liability is limited to $50. If the transfer is reported within 60 days, the liability is capped at $500. After that, the victim may end up shouldering the entire financial loss. In response to the FBI’s alert, banks are instituting new internal security measures. However, according to Lifelock’s youtube channel, even with multiple layers of security, would-be thieves can still find vulnerabilities, especially on the consumer’s side. A proactive approach to financial security reduces your risk for theft and helps you identify possible security breaches as soon as they happen. Use a different password for every online account. Should one account be compromised, thieves will not have easy access to your other accounts. Passwords should contain a random combination of upper and lowercase letters, numbers and symbols. Enroll in daily balance alerts. Many banks will email you daily balance updates. These emails are a quick way to check for fraudulent activity. Browse securely. Before providing financial information, be sure the website is secure; look for a padlock symbol in the lower right corner and “https://” in the URL. Never access financial websites from a public Internet kiosk or Internet cafe computer. Protect your wireless network. Enable wireless security features, including WPA encryption. Change the default SSID and password on your wireless router to prevent network hacking. Jonathan Edwards: Jonathan is a journalist who loves numbers. He covers the insurance, banking and mortgage industry news.